Silent Voices is a multimedia, multi-composer concert series conceived, produced and performed by the Chorus. The series launched in the Chorus’ 25th anniversary season with the world premiere at BAM’s Howard Gilman Opera House in May 2017. Silent Voices harnesses the power of young people to be instruments of change, giving voice to those silenced or marginalized in our communities. The Chorus commissioned a diverse group of innovative artists to interpret rich historical narratives and personal stories in creating music that explores race and identity, gender and sexuality, inequity and social disparity—music that matters. 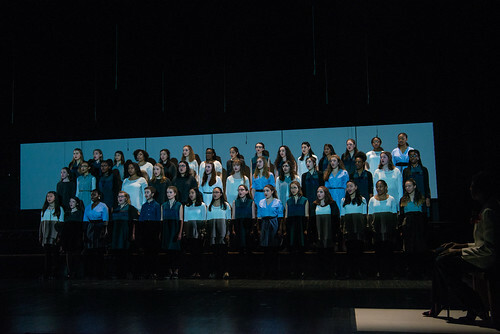 Launched in connection with Brooklyn Youth Chorus’s 2016-17 WQXR artist residency, Silent Voices was conceived by Dianne Berkun Menaker to engage the young singers artistically with the subjects and issues about which they are most passionate. She and stage director Kristin Marting co-curated the project, bringing together an unusually wide range of artistic collaborators spanning musical genres and art forms. Commissioned composers for the world premiere included Jeff Beal (“House of Cards”), Mary Kouyoumdjian, Nico Muhly, Shara Nova, Toshi Reagon, Kamala Sankaram, Caroline Shaw and Paul Miller/DJ Spooky. Original writings by Hilton Als (The New Yorker), who won the 2017 Pulitzer Prize for Criticism, Claudia Rankine (Citizen), and playwright Jackie Sibblies Drury round out the work, which also features personal narratives, interviews, and historical texts. The libretto includes passages from authors and thinkers including Michelle Alexander’s The New Jim Crow; George Savile, Marquis of Halifax’s 17th century chapbook to his daughter, The Lady’s New-Year’s Gift; and Patricia Bell-Scott’s The Firebrand and the First Lady, drawing from letters between civil rights activist Pauli Murray and First Lady Eleanor Roosevelt. Video projections by Peter Nigrini, photo portraiture by Jay Maisel, and costumes by rag & bone are integrated throughout. Unifying this musically and topically broad work is the distinctively beautiful sound of the rigorously-trained singers—a chorus of culturally and socioeconomically diverse New York City young people, ages 12–18. Silent Voices is generously supported by Aaron Copland Fund for Music; Amphion Foundation; Charles J. and Irene F. Hamm; Howard Gilman Foundation; the Laurie M. Tisch Illumination Fund; National Endowment for the Arts; New Music USA; NYC Department of Cultural Affairs; The BMI Foundation; and The MAP Fund. Special thanks to Marcus Wainwright and rag & bone for supporting the project by dressing the Chorus. The visual identity for Silent Voices was generously donated by Carbone Smolan Agency. Brooklyn Youth Chorus Now celebrating its 25th anniversary, Brooklyn Youth Chorus is a collective of young singers and vocal ensembles re-envisioning choral music performance through their distinctive, remarkable sound, artistic innovation, and collaboration with classical and contemporary artists. With an incredibly versatile range and unique repertoire, Brooklyn Youth Chorus combines intensive vocal training and music study with exceptional performances. The chorus has been touted by The New York Times as a “consistently bold organization” that regularly commissions and presents new music in genre-defying forms. The chorus’ after-school program encompasses multi-level training divisions and advanced performing ensembles as well as a full complement of enrichment classes and individual lessons. The 650 diverse students of its core after-school and public school outreach programs represents nearly 200 schools citywide. Classes take place at their Cobble Hill headquarters and neighborhood locations in Bedford-Stuyvesant and Red Hook, Brooklyn. DIANNE BERKUN MENAKER (Conceived and conducted by) is the founder and artistic director of Brooklyn Youth Chorus. Under her visionary leadership, the Chorus has become one of the most highly regarded ensembles in the country and has stretched the artistic boundaries for the youth chorus. Hailed by The New York Times as “a remarkable choral conductor,” Berkun Menaker has prepared choruses for performances with acclaimed conductors Alan Gilbert, Marin Alsop, James Levine, Gustavo Dudamel, and Robert Spano and others. Most notably, she prepared the Chorus for its 2002 debut with the New York Philharmonic in John Adams’s On the Transmigration of Souls, the recording for which the Chorus won a Grammy Award in 2005. Berkun Menaker is the creator of the Chorus’s Cross-Choral Training® program, a proven holistic and experiential approach to developing singers in a group setting encompassing both voice and musicianship pedagogy. KRISTIN MARTING (co-curator and director) is a director of hybrid work based in NYC. She has constructed 27 stage works, including 12 original hybrid works, 8 reimaginings of novels and 7 classic plays. Kristin has directed 17 works at HERE and also premiered works at 3LD, Ohio Theatre, and Soho Rep. Her work has toured to 7 Stages, Berkshire Festival, Brown, MCA, New World, Painted Bride, Perishable, UMass, Moscow Art Theatre and Oslo. She has directed workshops for Clubbed Thumb, New Georges, Playwrights Horizons, Public Theatre, Target Margin, and others. Select residencies include Bard, Cal Arts, LMCC, Mabou Mines, MASS MOCA, NACL, Orchard Project, Playwrights Center, and Williams. Kristin was named a nytheatre.com Person of the Decade, a Woman to Watch by ArtTable and received a BAX10 Award. Kristin is co-founder and Artistic Director of HERE, where she directs projects, cultivates artists and programs (including 17 OBIE-award winners) two performance spaces for an annual audience of 30,000. HELGA DAVIS (host) served as a principle actor in the 25th anniversary international revival of Robert Wilson and Philip Glass’s seminal opera Einstein on the Beach. Among the many collaborative and works written for her are Faust’s Box by acclaimed Italian contemporary music composer Andrea Liberovici; Oceanic Verses by Paola Prestini; Elsewhere by Missy Mazzolli; You Us We All by Shara Nova (My Brightest Diamond) and Andrew Ondrejcak; The Blue Planet by Peter Greenaway; and Yet Unheard, a tribute to Sandra Bland, by Courtney Bryan, based on the poem by Sharan Strange. Her work First Responder was conceived and performed at MASS MoCA in response to Nick Cave’s Until. As part of her 2017 Residency at National Sawdust, she created Requiem for a Tuesday with bass-baritone Davone Tines and dancer/choreographer Reggie Gray and is working on a CD release with visionary performance artist Yuka Honda. She is host of the HELGA podcast on WQXR’s Q2 music. HILTON ALS (show writer) became a staff writer at The New Yorker in 1996, a theatre critic in 2002, and chief theatre critic in 2013. His first book, The Women, a meditation on gender, race, and personal identity, was published in 1996. His most recent book, White Girls, discusses various narratives around race and gender and was nominated for a 2013 National Book Critics Circle Award in Criticism. Als is a professor at Columbia University’s Writing Program, and his work has appeared in The Nation, The Believer, and The New York Review of Books. He lives in New York City. THE INTERNATIONAL CONTEMPORARY ENSEMBLE (ICE) is an artist collective committed to transforming the way music is created and experienced. As performer, curator, and educator, ICE explores how new music intersects with communities across the world. The ensemble’s 35 members are featured as soloists, chamber musicians, commissioners, and collaborators with the foremost musical artists of our time. A recipient of the American Music Center’s Trailblazer Award and the Chamber Music America/ASCAP Award for Adventurous Programming, ICE was also named the 2014 Musical America Ensemble of the Year. The group currently serves as artists in residence at Lincoln Center for the Performing Arts’ Mostly Mozart Festival, and previously led a five-year residency at the Museum of Contemporary Art Chicago. Read more at iceorg.org. JEFF BEAL (composer) is a four-time Emmy Award winning composer known for his genre-defying musical fluidity. His film scores have received critical acclaim, while he remains a respected composer in the concert, theater, and dance worlds. Beal’s evocative score and theme for the Netflix drama House of Cards received four Emmy Award nominations, winning for score. Other lauded series include Monk (USA), and HBO’s Rome and Carnivale. Film scores include documentaries Blackfish, Queen of Versailles, and dramas Pollock and Appaloosa. Beal’s concert works have been performed by the St. Louis, Rochester, Pacific, Munich, and Detroit symphonies. Commissions include works for the Los Angeles Master Chorale, Smuin Ballet, Ying Quartet, and Grammy winning guitarist Jason Vieaux. Beal recently conducted the world premiere of House of Cards in Concert with the National Symphony Orchestra. He’s also recently conducted the Boston Symphony and Boston Pops Esplanade Orchestras in the recording and concert premieres of his film score BOSTON, a feature length documentary about the Boston Marathon. PAUL MILLER (composer) aka DJ Spooky is the executive editor of Origin Magazine and is a composer, multimedia artist, editor and author. His DJ Mixer iPad app has seen more than 12 million downloads. In 2012, he was the first artist-in-residence at the Metropolitan Museum of Art. He’s produced and composed work for Yoko Ono, Thurston Moore, and scores of artists and award-winning films. Miller’s work as a media artist has appeared in the Whitney Biennial; The Venice Biennial for Architecture; the Ludwig Museum in Cologne, Germany; Kunsthalle, Vienna; The Andy Warhol Museum in Pittsburgh and other. His book Sound Unbound, an anthology of writings on electronic music and digital media is a best-selling title for MIT Press. Mr. Miller continues his globe-trotting series of live events playing at festivals from France to Japan to Mexico City, performing solo, with chamber groups, and with orchestras, and giving talks at prominent universities and conferences. NICO MUHLY (composer) is an American composer and sought-after collaborator whose influences range from American minimalism to the Anglican choral tradition. The recipient of commissions from The Metropolitan Opera, Carnegie Hall, St. Paul’s Cathedral, and others, he has written more than 80 works for the concert stage, including the forthcoming opera Marnie. Muhly is a frequent collaborator with choreographer Benjamin Millepied and, as an arranger, has paired with Sufjan Stevens, Antony and the Johnsons and others. His work for stage and screen include music for the 2013 Broadway revival of The Glass Menagerie and scores for films including the Academy Award-winning The Reader. Born in Vermont, Muhly studied composition at the Juilliard School before working as an editor and conductor for Philip Glass. He is part of the artist-run record label Bedroom Community, which released his first two albums, Speaks Volumes (2006) and Mothertongue (2008). He lives in New York City. Born in “The Diamond state” of Arkansas to a family of musical traveling evangelists, SHARA NOVA (composer) (formerly Worden) moved across America throughout her youth, then went on to study classical voice at The University of North Texas. After moving to New York City she assembled her chamber pop band, My Brightest Diamond in 2001, subsequently releasing four albums on Asthmatic Kitty Records. Nova has composed works for yMusic, Brooklyn Youth Chorus, Young New Yorkers’ Chorus, Brooklyn Rider, Nadia Sirota and Roomful of Teeth among others. Her baroque chamber p’opera You Us We All premiered at BAM Next Wave Festival in October 2015. Many composers, songwriters and filmmakers have sought out Nova’s voice, including David Lang, David Byrne, The Decemberists, Bryce Dessner, Steve Mackey, Sarah Kirkland Snider, Sufjan Stevens and Matthew Barney. Nova is a Kresge Fellow, Knights Grant recipient and a United States Artist fellow. TOSHI REAGON (composer) is a talented, versatile singer, composer, musician, curator and producer with a profound ear for sonic Americana—from folk to funk, from blues to rock. While her expansive career has landed her comfortably in residence at Carnegie Hall, the Paris Opera House & Madison Square Garden, you can just as easily find Ms. Reagon turning out a music festival, intimate venue or local club. She is a recipient of a NYFA Award for Music Composition, a national Women’s History Month Honoree, and was the music director for the national Women’s March on Washington in January. Ms. Reagon’s current touring projects include “Celebrate The Great Women of Blues and Jazz” a 16-piece all women’s ensemble of some of New York’s best instrumentalists and vocalists. She is currently developing an opera based on Octavia E. Butler’s novel Parable of the Sower, debuting fall 2017. CAROLINE ADELAIDE SHAW (composer) is a New York-based musician. She is the youngest ever winner of the Pulitzer Prize for Music, for her enigmatic composition Partita for 8 Voices. Her career defies categorization—she performs as a violin soloist, chamber musician, and as a vocalist in the Grammy-winning ensemble Roomful of Teeth. Recent commissions include works for Carnegie Hall, the Guggenheim Museum, the St. Paul Chamber Orchestra with Jonathan Biss, and mezzo-soprano Anne Sofie von Otter. She also frequently collaborates with Kanye West. Currently a doctoral candidate at Princeton, Caroline also studied at Rice and Yale. Caroline loves the color yellow, otters, Beethoven opus 74, Mozart opera, the smell of rosemary, and the sound of a janky mandolin. PETER NIGRINI (Set & Video Designer) is one of Broadway’s leading projection designers who for the past fifteen years he has been a pioneer in the integration of digital projection technology and live theatre. Designs include Real Enemies, which premiered in the 2015 Next Wave Festival, Dear Evan Hansen, Amélie, the David Byrne musical Here Lies Love, Will Eno’s Wakey Wakey, Fela, An Act of God, Grounded, at the Public Theater, and Robert Woodruff’s adaptation of Dostoyevsky’s Notes from Underground, first produced at Yale Repertory Theatre and remounted at La Jolla Playhouse and Theatre for a New Audience. In addition to his work in the theater, he also designs in other mediums, including the Grace Jones Hurricane tour. He is also a founding member and the sole designer for Nature Theater of Oklahoma. This summer he will premiere a new production of Lucia di Lammermoor for the Santa Fe Opera. JEANNETTE OI-SUK YEW (Lighting Designer) is a lighting designer for theatre, opera, dance, music performances and installation. Her designs were described as “clever” and “inventive” (The New York Times). She has designed for productions at the Metropolitan Museum of Art, BAM, St. Ann’s Warehouse, Manhattan School of Music, and internationally in Havana, Prague, Lima, Edinburgh, Shanghai and Tokyo. She designed Tan Dun’s Water Passion, Mysterium Novum with The Nouveau Classical Project, The Idiot with Kristin Marting and Robert Lyons, Sam Falls’ September Spring, Aya Ogawa’s Ludic Proxy (Bel Geddes Design Enhancement award), HK Gruber’s Gloria – A Pig Tale with Alan Gilbert and Doug Fitch, Schubert’s Fierrabras with Leon Botstein, Aaron Siegel’s Brother Brother, Company XIV’s Rococo Rogue and Nutcracker Rogue (received various Drama Desk nominations), and Matthew Paul Olmos’ So Go the Ghosts of Mexico Part One (Best Lighting Design nomination). She is a recipient of the NEA/TCG Career Development Program. Cutting his teeth (or ears) as an engineer on the New York City contemporary music scene (le Poisson Rouge, VisionIntoArt/National Sawdust, Beth Morrison Productions, MATA), GARTH MACALEAVEY (Sound Engineer) specializes in concert amplification and sound design for both traditional and experimental music performance. An avid musician, MacAleavey’s career in audio was strongly influenced by his time as a student of avant garde percussion at UCSC under the tutelage of Willie Winant. MacAleavey’s recent credits include the sound design for “FLEXN” with Peter Sellars at the Park Avenue Armory, engineering Jeff Zeigler/Andy Akiho/Roger Bonair-Agard at the Prospect Park Bandshell for Celebrate Brooklyn and mixing Alarm Will Sound with Dance Heginbotham in Seoul, Korea. His past credits include Kronos Quartet, Philip Glass Ensemble, Terry and Gyan Riley, David T. Little, Steve Reich, Paul Simon, Atoms for Peace, Erykah Badu, The Brooklyn Philharmonic and many more. KATE FRY (Costume Designer) designs costumes for opera, theater, film, and dance. Her work explores clothing as poetry, to illustrate the complex nature of identity as both individual and contextual within society. Recently, Fry’s designs have shown with the LA Philharmonic (composer Jacob Cooper) and at the Spoleto Festival USA (The Little Match Girl, a collaboration with puppeteer Mark Down and director Phelim McDermott). Beyond the stage, Fry’s work ranges from fine art – teaming up with French artist Julien Previeux’s project What Shall We Do Next (winner of the Prix Marcel Duchamp), to film and television, most recently designing costumes for a 1960s era television pilot, The Picture (directed by David Winkler). Fry’s work has been shown at The Public Theater, NY City Center, Grand Palais Paris, 3LD, La Mama, HERE Arts Center, Walt Disney Concert Hall, REDCAT, Prototype Opera Festival, The Bootleg Theater, Honor Fraser gallery, Prague Quadrennial, and the Tribeca Film Festival. MFA: California Institute of the Arts. PETER McCABE (Dramaturg) is resident dramaturg at HERE Arts Center. His credits include Don Christobal by Erin Orr and Rima Fand, Send for the Million Men by Joseph Silovksy, and Casablacabox by Reid and Sara Farrington all at HERE. He received a Jerome Grant to write and produce the live radio/theater event Stanford White: Murder, Love, and Insanity in the Guided Age for Clocktower Radio. Presently he is working on Get Jack by Damien Gray and Kip Winger, a revenge drama about the ghosts of Jack the Ripper’s victims; adapting his third Emperor and the Queen play into the burlesque opera with Kamala Sankaram; developing a new unannounced cabaret show with Damien Gray. As a producer, with his wife Hillary Richard, their production of the rock and roll musical Lizzie Borden was nominated for 3 Drama Desk Awards and has spawned over a dozen additional productions. He lives in Brooklyn with his wife and three daughters. DAN SCULLY (Scenic & Video Design) Recent work includes If/Then (National Tour), Rocky (Broadway), Jedermann (Salzburg Festival), Untitled America (Alvin Ailey/ADT), A Charlie Brown Christmas (New York Pops), The Orchestra Moves! (Carnegie Hall), and When the Wolves Came In (Kyle Abraham/Abraham.In.Motion); and projects at Trinity Repertory Theater, La Jolla Playhouse, Asolo Rep, Cleveland Playhouse, ARS NOVA, and GEVA Theater. NUNALLY KERSH (Executive Producer) is an independent producer in the contemporary performing arts sector, working with a wide variety of institutions and artists. Prior to working independently, she served as Executive Producer of Spoleto Festival USA in Charleston, SC for more than 15 years. Before relocating to Charleston, she worked with a variety of New York-based cultural organizations including the Lincoln Center Festival, PS122, BAM, and the French Cultural Services. In working with and developing the voice of countless young people through Brooklyn Youth Chorus, I have been continuously amazed at not just their artistry, but their intellectual curiosity. In the words of one chorister, “we can’t sing about important topics if we’re not going to talk about them.” Indeed the Silent Voices project—aimed at giving voice, and amplifying the voices of those who feel unheard or marginalized—has created a forum for discussion that has deepened our understanding and ability to express through our music the passion we feel about these topics. As part of the chorus’ 25th anniversary year, we celebrate the choristers themselves—giving them the opportunity to shape a multimedia choral music production that speaks directly to the concerns of these young people, living in our city and our time. The diverse choristers of Brooklyn Youth Chorus want to engage with each other, and with audiences, on the topics of race, gender, sexual identity, class, and economic disparity, and the place of immigrants and refugees in our communities. In the same way that these young musicians have cultivated their own voices as a foundation of their identity, they are here to stand beside, and stand up for, others that need support. With Silent Voices, we are bringing our young people into the conversation; we are helping them explore the issues and problems that they face now and will inherit as they come of age. We have looked into the past—exploring the unusual and influential relationship between Pauli Murray and First Lady Eleanor Roosevelt that helped shape the course of civil rights—as well as responding to contemporary narratives from notables such as Claudia Rankine and Michelle Alexander. But most importantly, we are inviting the choristers themselves to share their personal experiences and testimonials, directly engaging with the audience in the first person. An incredible team of composers and artists have helped develop and shape this project, each bringing a unique and important perspective to the work. The composers, as diverse as the issues themselves, have each chosen the themes for their own compositions and engaged the choristers in the development of their work. With our incredible director Kristin Marting, videographer and set designers Peter Nigrini and Dan Scully, and lighting designer Jeanette Yew, we will bring the BAM stage to life with sound and visuals and stories that engage in the moment and leave a lasting impression—creating music that matters!